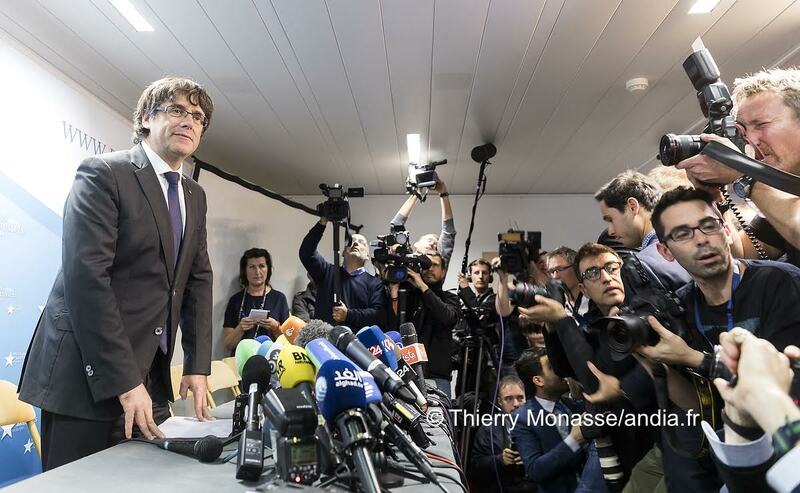 [Updated at 8.15 on 1 November] Ex-Catalan leader Carles Puigdemont reappeared in public in Brussels on Tuesday (31 October), where he said he would continue to lead a government despite being dismissed by the Spanish government. "One part of the government, led by me as the legitimate president, has come to Brussels in order to explain the Catalan problem in the institutional heart of Europe," he told a crowd of reporters packed into the Press Club, in the heart of the EU quarter. Puigdemont was with five members of the regional government that was dismissed last Friday. 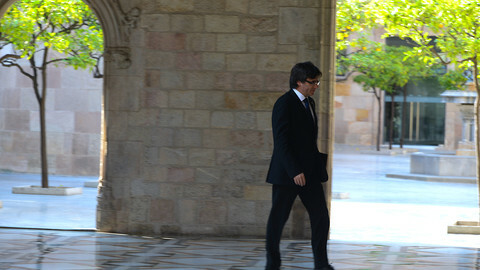 He said that the other "legitimate ministers" would continue to "carry out political activities" in Barcelona. Asked by EUobserver after the press conference, Joaquim Forn, who was in charge of home affairs, did not specify what these "activities" would be or how the two parts of the team would work together from afar. Forn, together with Bassa, however flew back to Barcelona on Tuesday evening. They were met at the airport with people shouting "in prison" or "traitors". Puigdemont, who had left his hotel in Brussels, was also said to be on the plane, but he was not seen landing in Barcelona. His exact whereabouts were unknown on Tuesday morning. Puigdemont, who secretly travelled to Belgium on Monday, denied rumours that he came to request political protection. 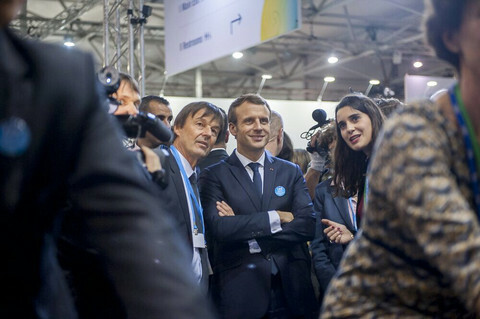 "I'm not here to demand political asylum," he said, adding that he was in Brussels "as the capital of Europe" and that his presence there was "not a Belgian issue". But he did not explain why he took as a lawyer Paul Bekaert, who in the past worked for alleged members of the Basque terror group ETA. Bekaert later told the Flemish media VRT that "the possibility of political asylum is not yet completely off the table". Belgian prime minister Charles Michel said that the Catalan politician would be treated "as any European citizen, no more, no less". Puigdemont and 13 members of the dismissed government were summoned on Tuesday by a judge in Madrid. They are required to appear in the National Court on Thursday at 9AM, and were given three days to pay a combined deposit against potential penalties of €6.2 million. Puigdemont said that he would stay in Brussels as long as he could not get "guarantees" that he will receive a "fair treatment" in Spain. "If we have guarantees, we would go back immediately," he said. He said he was in Brussels to "act with freedom and safety in order to take decisions." 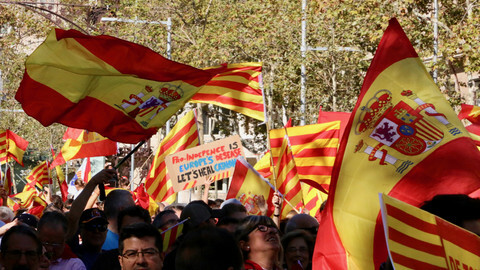 He argued that charges of rebellion, sedition and embezzlement open against him and 19 other separatist leaders were a "politicisation of the Spanish justice [system]." He said that Spanish authorities were "persecuting an idea, some people, not a crime". Puigdemont, who tried before and after the 1 October independence referendum to get the EU involved as mediator between his government and the Spanish government, called on the "international community and especially Europe to react". He said that the absence of dialogue, as well as the risk of violence from far-right groups and what he described as "the imposition by military means and our imprisonment for 30 years" would "end with the idea of Europe". 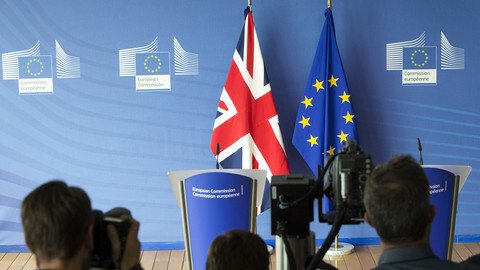 "It is a mistake that we can all pay at a very high cost as European citizens," he said. Puigdemont's press conference was announced mid-morning and took place in the Press Club after the Belgian government vetoed the use of the Residence Palace, a larger venue just next to the European Council that is under the foreign ministry's management. 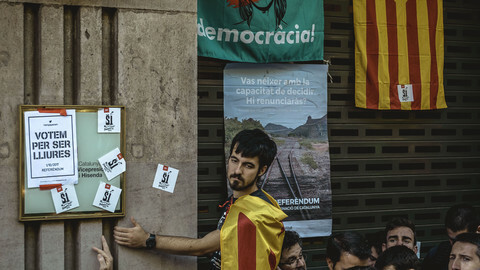 While dozens of international journalists were packed inside, supporters of Spanish unity and Catalan independence were facing each others outside the Press Club. Belgian police were there to ensure that Puigdemont and his colleagues' taxis could safely enter and leave the building's car park. Puigdemont took several questions in English, French and Catalan but not in Spanish. In the morning, he held a meeting at the headquarters of the European Free Alliance (EFA), a network of nationalist parties that counts the Flemish N-VA, and the Scottish Nationalist Party among its members. An EFA source declined to tell EUobserver the purpose of the meeting or what kind of support Puigdemont would get from EFA. The source said that the logistics of Puigdemont and his five colleagues' stay in Brussels - whom he referred to as "the resistants" - were not yet decided for the long run. Puigdemont said that the strategy to go to Brussels was decided on Friday evening, after the Catalan parliament declared the region's independence and the Spanish government reacted by launching measures under article 155 of the constitution. Puigdemont said he had to "adapt" to a "highly aggressive and unprecedented offensive against the people of Catalonia". In Barcelona, Spanish officials said that Puigdemont was now "a normal person" and insisted that the priority for Madrid was "a return to normality as soon as possible." "All continues normally. There is no tension nor preoccupation," a government source told journalists after 155 Catalan officials were sacked in Barcelona, and in Catalan delegations abroad, since Friday. "There is no horror movie here," the source said. A Catalan government civil servant however told EUobserver that there was a feeling of confusion among his colleagues over the coming weeks and months. "No one knows what will happen," he said. The civil servant said he had not heard anyone at the office talking about disobedience. But "there are many ways of being disobedient if that is what people want to be." Another Catalan government source also told this website that officials abroad did not really know what would happen to them. The source, referring to Puigdemont, said that many wanted to "continue to work for the president". The Spanish government source insisted that "the independence process has ended" and that "the most democratic way to return to normality was to call elections." "It is to guarantee the neutrality of the administration – an administration for all the citizens and not just for a sector in the Catalan society," she said. Puigdemont in Brussels said that the elections, which will take place on 21 December posed "a democratic challenge" to the separatists. He said however that "if the Spanish state wants to make a plebiscite to legitimise article 155 and its policies, we will face it." He assured that he would "respect the result of the election as we have always done, whatever it may be." "Will the Spanish government and the '155 block' do the same?" he asked. In Barcelona, a first poll published just after Puigdemont's press conference, said that the outgoing pro-independence coalition, Junts pel Si, would win an absolute majority. It is not certain however that Junt pel Si will remain united. The Spanish government source in Barcelona did not want to speculate on the outcome of the December vote, and insisted that with "the result of the elections, the priority is that the law will continue to be respected, which we are sure it will." "The fact that [the separatist parties] have already confirmed their participation in the elections with the Spanish legality is very significant," she said. [Updated] Carles Puigdemont, who was dismissed on Friday and charged with sedition on Monday, is in Brussels, reportedly seeking asylum. There are no official details about the trip but a press conference is planned for Tuesday lunchtime. Three days after Madrid adopted measures to counter Catalonia's unrecognised declaration of independence, the question is whether the Catalan ministers will show up to work and who the civil servants will take orders from. 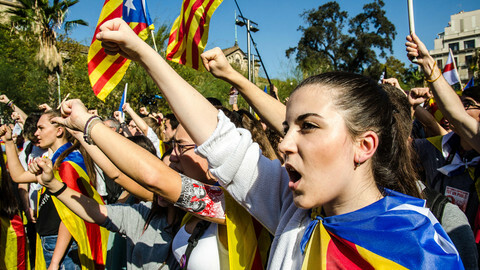 The Spanish government will suspend Catalonia's autonomy, after the region's parliament declared its independence. The EU does not recognise the would-be state and warns against the use of force. Brexit, Catalonia, Malta, Poland, and CO2 – a full agenda for the EU across foreign, domestic and climate issues next week. A European arrest warrant is about to be issued against the former president of the Catalan government, who says his colleagues are "political prisoners." 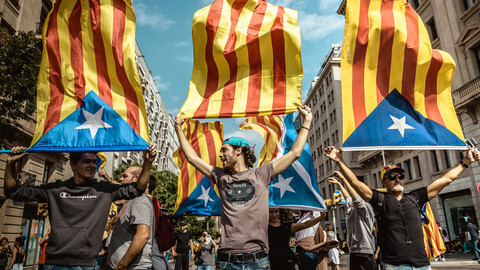 The crisis over Catalonia's bid for independence highlights two theories of geo-politics - the 'choice' theory versus the 'just cause' theory of secessionist movements.